These two model forms of agreement are compatible with the 2017 fifth edition of FIDIC’s "Client/Consultant Model Services Agreement" (the White Book). 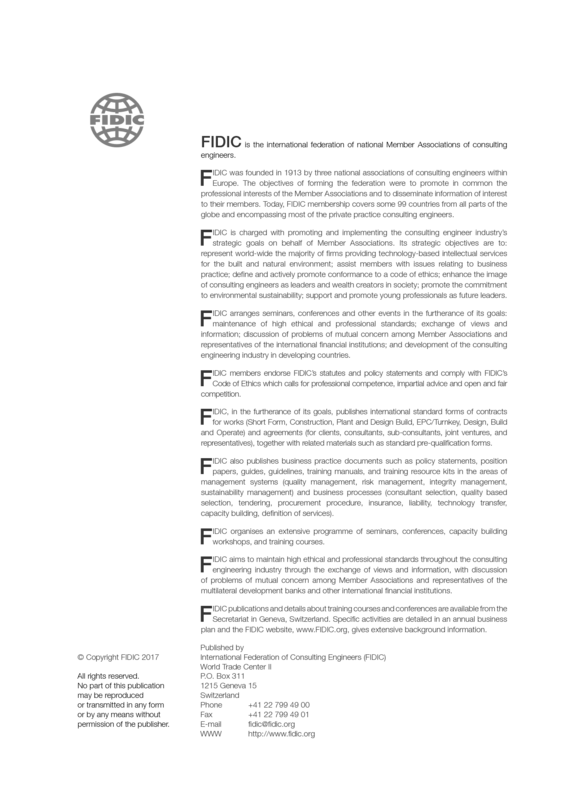 FIDIC intends to publish Guides on the use of all of these Agreements. The Joint Venture´s action, capacities and internal decision making processes have been clearly structured. 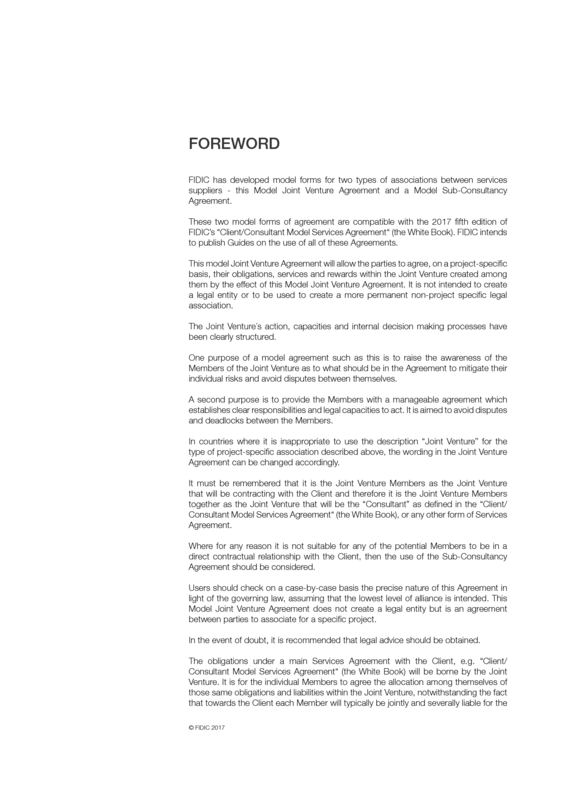 One purpose of a model agreement such as this is to raise the awareness of the Members of the Joint Venture as to what should be in the Agreement to mitigate their individual risks and avoid disputes between themselves. A second purpose is to provide the Members with a manageable agreement which establishes clear responsibilities and legal capacities to act. It is aimed to avoid disputes and deadlocks between the Members. In countries where it is inappropriate to use the description "Joint Venture" for the type of project-specific association described above, the wording in the Joint Venture Agreement can be changed accordingly. It must be remembered that it is the Joint Venture Members as the Joint Venture that will be contracting with the Client and therefore it is the Joint Venture Members together as the Joint Venture that will be the "Consultant" as defined in the "Client/Consultant Model Services Agreement" (the White Book), or any other form of Services Agreement. Where for any reason it is not suitable for any of the potential Members to be in a direct contractual relationship with the Client, then the use of the Sub-Consultancy Agreement should be considered. Users should check on a case-by-case basis the precise nature of this Agreement in light of the governing law, assuming that the lowest level of alliance is intended. This Model Joint Venture Agreement does not create a legal entity but is an agreement between parties to associate for a specific project. In the event of doubt, it is recommended that legal advice should be obtained. The obligations under a main Services Agreement with the Client, e.g. "Client/Consultant Model Services Agreement" (the White Book) will be borne by the Joint Venture. It is for the individual Members to agree the allocation among themselves of those same obligations and liabilities within the Joint Venture, notwithstanding the fact that towards the Client each Member will typically be jointly and severally liable for the performance of Services under the main Services Agreement with the Client and for any breach thereof. At the same time the sharing of duties and liabilities requires the Joint Venture Members to coordinate their efforts in an effective and efficient manner. If one, or several, of the Members cannot fulfil its/their share of the Joint Venture obligations then the remaining Member(s) will have to fulfil the obligations of the failing Member(s) between them, and this should be addressed in the Joint Venture Agreement. At any time until completion of the Services the Joint Venture Members should agree on joint efforts with regard to changes in the scope of services and other challenges. If agreement cannot be achieved, all Members may become liable for failure to comply with their duties as a result of disagreement among the Members of the Joint Venture. Certain issues deserve detailed attention to ensure that, when the Joint Venture is appointed, each Member undertakes its agreed tasks and obligations. In particular, the matter of insurances and guarantees requires early attention to ensure that the professional liability of the Joint Venture is fully covered. Individual interest cannot always prevail. In order to be successful as a Joint Venture, it is essential the Members commit to develop joint efforts in respect of the execution and completion of Services and achieving agreement in respect of any changes to the Services, and other daily matters. If the Members fail to do so, then effective contractual machinery must be available in order to avoid disadvantage or detriment for the Joint Venture and its Members. When transfer of technology is an important part of a project, this should be set out in the written appointment and terms of the Services Agreement. - The consequence of the transfer of technology programme on the project schedule. 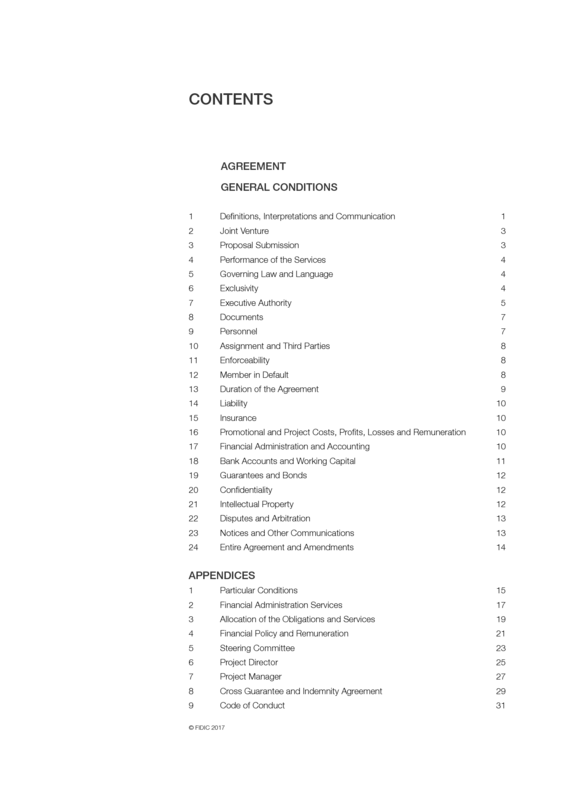 The emphasis of the main Services Agreement, e.g. the Client/Consultant Model Services Agreement ("White Book") is on the fulfilment of obligations under that Services Agreement ("White Book"), rather than the assignment of different tasks to the Members. One objective of the Joint Venture Agreement is therefore the promotion of an integrated team approach in order to achieve the satisfactory completion of the Services required under the main Services Agreement. The details of the Joint Venture Agreement are not always available when the Joint Venture is established. The services to be performed by each Member can be agreed after the Proposal has been accepted by the Client. A less detailed agreement, a Pre-Proposal Joint Venture Agreement, can be established prior to submission of the Proposal. Such agreement should then be replaced by a final Joint Venture Agreement in case of a successful Proposal. However, the purpose of this Model Joint Venture Agreement is to establish a manageable situation allowing its Members to respond jointly to an invitation to tender, to submit a Proposal and to execute the Services using the resources of all Members in an appropriate way. This Model Joint Venture Agreement provides for the completion of several Appendices. The examples provided at the end of the document are for guidance only. For most projects, they should be considered to be the minimum required. Appendix 1 [Particular Conditions] – the Particular Conditions, Part A and B of this Appendix needs to be completed with the project specific requirements and definitions. - how payments to each Member will be managed. - how the transfer of technology will be carried out. - agreements regarding additional costs incurred by a Member but disallowed by the Client. 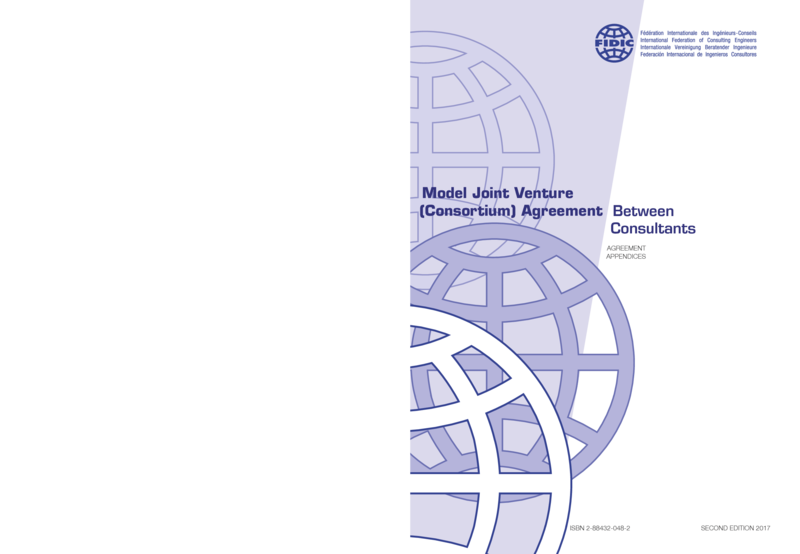 Joint Venture (Consortium) Agreement (1st Ed, 1992). 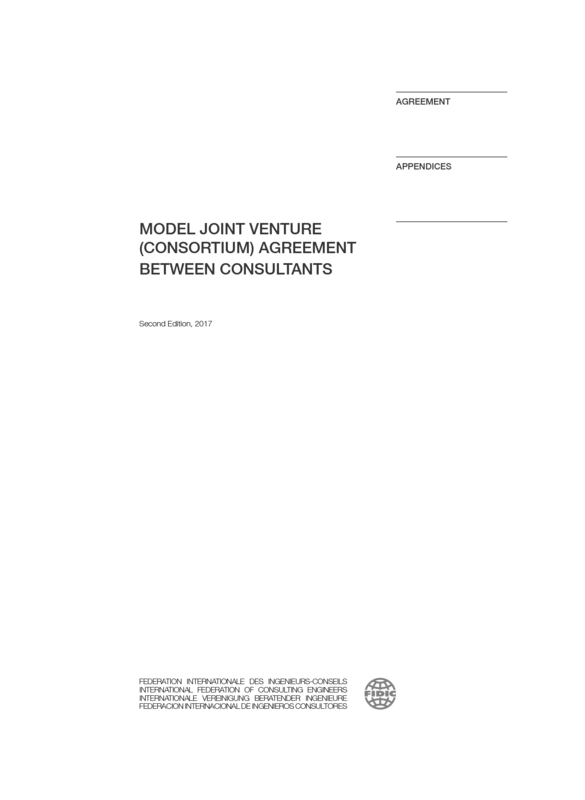 Guide to the Joint Venture and Sub-Consultancy Agreement (1st Ed, 1994).